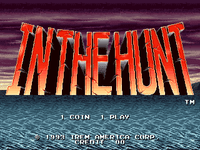 In the Hunt (海底大戦争, Kaitei Daisensou) is a horizontal scrolling shooter arcade game by Irem. It was released in 1993 and later ported to the Sega Saturn, the PlayStation and Windows 95 for the PC by Kokopeli. The game was developed by the team who would go on to create Gunforce 2 for Irem and the Metal Slug series for SNK. The similarities are clearly seen in the artistic style used. In the Hunt is particularly unusual as the player takes the role of a submarine in underwater environments, although Irem has previously developed a similar game called Sqoon for the Nintendo Entertainment System. There are a total of six levels in the game. An organization known as the D.A.S. (Dark Anarchy Society) used a doomsday machine called the Yugusukyure on the South Pole, causing the polar ice caps to melt. The entire world was quickly flooded, but a few societies survived to build over the highest structures they could find and continue living. In this post apocalyptic scenario, the D.A.S., who were prepared for this catastrophe, reigns supreme over the survivors with martial law and military weapons of extraordinary power. The remaining survivors who are terrorized by D.A.S. secretly organize a rebellion force using a newly developed submarine known as the Granvia. The Granvia’s mission is to dive into D.A.S. enforced waters, territories and eventually the D.A.S. headquarters itself to destroy every single D.A.S. weapon in sight. Source: Wikipedia, "In the Hunt", available under the CC-BY-SA License.